Firms, and especially affiliates of multinational enterprises (MNEs), are often controlled through hierarchical webs of ownership involving a multitude of entities. More than 40 per cent of foreign affiliates are owned through complex chains with multiple cross-border links involving on average three jurisdictions (figure 10). That implies that the nationality of investors in, and owners of, foreign affiliates is becoming increasingly blurred. The blurring of investor nationality has important implications for national and international investment policies. Most countries have investment rules and promotion tools that are conditional on ownership and nationality. Almost 80 per cent of countries worldwide prohibit majority foreign ownership in at least one industry. Bilateral and regional investment agreements aim to provide benefits only to investors originating in the jurisdictions of treaty partners. In designing national investment policies and in negotiating investment agreements, policymakers need to consider carefully the effectiveness and suitability of ownership-based measures, as well as the practical implications for their application and enforcement. Common types of complexity in internal MNE ownership structures are lengthy ownership chains with multiple cross-border links, ownership hubs and shared ownership structures. Ownership of affiliates is expressed in shareholdings, which provide cash-flow rights and voting rights. Control is the ability to exercise voting rights to affect strategic management decisions. In the internal ownership structure of MNEs, control generally coincides with (direct or indirect) majority ownership. However, MNEs can exercise control over affiliates even when they have a minority stake. The universe of MNEs is highly skewed: a very large group of MNEs is simple, with few affiliates directly and fully owned by the parent company. A very small group of MNEs accounts for a large share of foreign affiliates. 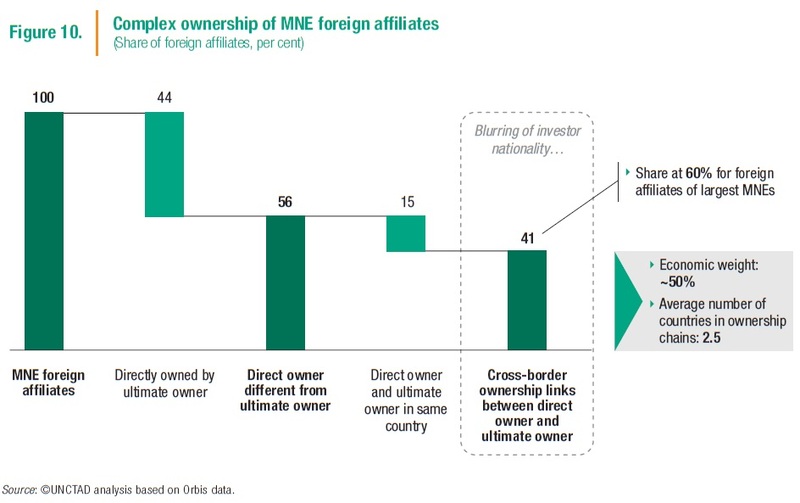 Less than one per cent of MNEs have more than 100 affiliates, but these account for more than 30 per cent of all foreign affiliates and almost 60 per cent of global MNE value added. The larger the MNEs, the greater the complexity of their internal ownership structures is. The top 100 MNEs in UNCTAD’s Transnationality Index have on average more than 500 affiliates across more than 50 countries, seven hierarchical levels in their ownership structure (i.e. affiliates could potentially have seven “passports”), about 20 holding companies owning affiliates across multiple jurisdictions, and almost 70 entities in offshore investment hubs. MNE ownership structures are often the result of historical accident or haphazard growth patterns. Even when MNEs wish to simplify ownership structures in “entity reduction programmes”, they are often prevented from doing so because of legal and fiscal constraints, or arrangements with banks. Where MNEs deliberately incorporate elements of complexity (e.g. lengthy ownership chains, multiple owners of affiliates, or different locations of direct versus ultimate owners), these are most often dictated by governance rules and risk management, financing, tax, and other institutional or policy-related considerations. Investment policy is one of several policy drivers behind complex ownership structures. The long-term trends causing an increasing share of international production to be concentrated in the largest MNEs are also likely to result in increasing complex MNE ownership worldwide. Insights on the ownership structures of MNEs as a whole (top-down perspective) are useful to show overall complexity. However, for investment policymakers, a bottom-up perspective looking at the ownership chain starting from the foreign affiliate, through its direct owners, and up to its ultimate owner can be more helpful. For WIR16, UNCTAD has developed a firm-level dataset including some 4.5 million companies that enables a bottom-up approach. 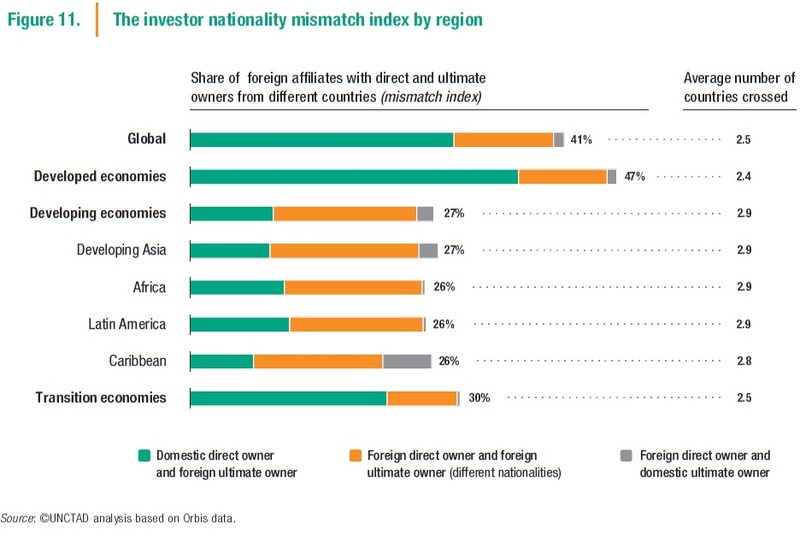 The investor nationality “mismatch index” is considerably higher for the largest MNEs: 60 per cent of their foreign affiliates have multiple cross-border ownership links to the parent company. Mismatches involve almost half of foreign affiliates in developed economies, and more than a quarter in developing economies. Whereas most mismatches in developed countries are caused by multi-layered ownership structures within host countries, in developing countries they are more often the result of investments transiting through third countries (figure 11). National and international investment policy measures that differentiate between domestic and foreign companies or between foreign investors of different nationalities include entry restrictions and ownership caps; operating restrictions or performance requirements; investment facilitation and incentives; and investment protection. These measures are most often driven by national security concerns; protection of national and strategic assets; industrial development and competition policies; social, cultural or political concerns; and regional integration policies. Complex ownership structures and investor nationality mismatches make the application of rules and regulations on foreign ownership more complex. They also raise important questions about the coverage of IIAs. For national investment policies, the distinction between domestic and foreign investment is important. Therefore, the most relevant nationality mismatches are investments that are indirectly foreign owned through a domestic entity, and round-tripping investments. For IIAs, the distinction between different nationalities of investors is important. Therefore, the most relevant mismatch cases are transit investments through third countries and, again, round-tripping investments. At the national policy level, rules and regulations about foreign ownership are widespread. Services are relatively more affected by foreign equity limitations, in particular in media, transportation, communication, utilities and financial and business services. Extractive industries and agriculture are also frequently regulated through ownership restrictions. The trend in ownership-related measures since 2010 is towards liberalization, through the lifting of restrictions, increases in allowed foreign shareholdings, easing of approvals and admission, and greater access to land for foreign investors. However, many ownership restrictions remain in place in both developing and developed countries. The determination of investor nationality is part of foreign-investment registration and approval procedures; sector-specific licensing (when foreign ownership restrictions apply); and national-security-related foreign investment reviews. Approval procedures covering all sectors, including those without ownership restrictions, exist in many countries. Disclosure requirements for investors vary by country; not all regulators and authorities require disclosure of ultimate ownership. National-security reviews tend to examine the full ownership structure of MNEs. Ownership complexity has made the effective implementation and enforcement of ownership restrictions and ownership-based rules and regulations difficult and burdensome. Key challenges for national investment policymakers are (i) how to assess aggregate direct and indirect ownership, (ii) how to prevent de facto foreign control, and (iii) how to avoid undue access to benefits reserved for foreign investors by host State nationals. Policymakers in some countries have developed a range of mechanisms to safeguard the effectiveness of foreign ownership rules, including anti-dummy laws, general anti-abuse rules to prevent foreign control, and disclosure requirements aimed at monitoring ownership- and non-ownership-based control. In international investment policymaking, ownership chains have the potential to significantly expand the reach of IIAs. About one third of investor-State dispute settlement (ISDS) claims in 2010–2015 are filed by claimant entities that are ultimately owned by a parent in a third country (not party to the treaty on which the claim is based). More than a quarter of these claimants do not have substantial operations in the treaty country – this share can increase up to 75 per cent considering claims based on treaties concluded by major ownership hub locations. IIAs increasingly circumscribe their coverage in response to three specific challenges: claims brought (i) by entities controlled by a third-country or host-State entity (round-tripping), (ii) by mailbox companies, or (iii) by entities with ownership links to the investment that were purposely created in anticipation of a claim (time-sensitive restructuring). They can do so through more restrictive definitions and through denial of benefits (DoB) clauses. In addition, IIAs can clarify the meaning of effective control, if necessary urging tribunals to ascertain the ultimate owner controlling the relevant investment. To rule out claims by mailbox companies, IIAs can require that claimants have substantial business activities (SBA) and provide indicators for what might constitute SBA. Finally, IIAs can deny ISDS access to entities that have restructured at a time when a dispute had already arisen or was foreseeable. However, only half of the new IIAs (those concluded since 2012) and hardly any of the older IIAs include DoB clauses. The increasing complexity of MNE ownership networks is largely a consequence of globalization. 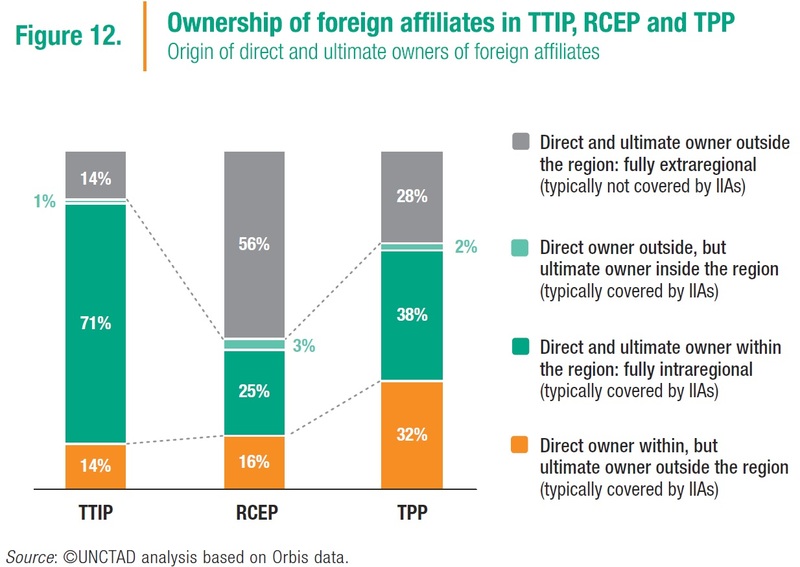 The practical difficulty of determining ultimate ownership of, and control over, foreign affiliates call into question the effectiveness of some ownership-based investment policies. Policymakers should evaluate the rationale for rules and regulations on foreign ownership and assess their relative effectiveness and “fit-for-purpose” compared with alternative policies (such as competition or industrial development policies), where this is feasible and appropriate. Some countries may require assistance, including by international organizations, to build the necessary regulatory and institutional capacity. Where ownership-based policies are considered necessary, investment authorities can improve disclosure requirements to assess ownership chains and ultimate ownership. They should be aware of the administrative burden this can impose on public institutions and on investors. Synergies with other agencies in policy areas that investigate ownership chains, such as competition authorities and tax authorities, should be exploited. At the international level, policymakers should be aware of the de facto multilateralizing effect of ownership complexity. The broad definition of investors/investments in investment treaties, combined with large MNEs’ extensive networks of affiliates and the ease of establishing legal entities in many jurisdictions, significantly extend the coverage of IIAs. This is highly relevant also for regional treaties and treaty negotiations: between one seventh (TTIP) and one third (TPP) of apparently intra-regional foreign affiliates in major megaregional treaty areas are ultimately owned by parents outside the region, raising questions as to the ultimate beneficiaries of these treaties and negotiations (figure 12). Policymakers should aim to avoid uncertainty for both States and investors about the coverage of the international investment regime and its multitude of bilateral, regional and megaregional treaties. International collaboration could aim to build a common understanding of “effective control” and a common set of criteria for substantial business activity and for identifying the origin of investors, as a basis for a more consistent interpretation of investment rules and treaty coverage, and as an integral part of global efforts to facilitate international investment. In conclusion, the overarching objective of investment policy is to make investment work for sustainable development, maximizing its benefits and minimizing its negative effects. Complex ownership structures call into question the effectiveness of ownership-based policy tools widely used for this purpose, both nationally and internationally. This requires a re-evaluation of these tools for the pursuit of the common goal. One approach is to enhance the application of ownership-based regulations by improving disclosure requirements and procedures to identify the ultimate owner of an investment. Another approach is to replace, where feasible and appropriate, ownership-based regulations with other policies such as competition, taxation, industrial development, public services or cultural policies. It is important to find the right policy mix, effective and proportionate. Whichever approach is chosen, a balance between liberalization and regulation must be found in pursuing the ultimate objective of promoting investment for sustainable development. To help policymakers chart a way forward, WIR16 provides insights on the global map of ownership links in MNEs and on how national and international policymakers around the world can respond to the challenges posed by complex ownership structures. The new data, empirical analysis, and policy responses presented here can inspire further research to support better informed policy decisions. They also make a strong case for targeted technical assistance and capacity building, and for more international consensus building. UNCTAD will continue to support these efforts.